Tim Murphy founded Presidential Pools, Spas & Patio more than 26 years ago. Before then, he was cleaning pools as a teenager. He's made it his life's work to transform Arizonians' backyards and built a team of people who feel the same way. The passion has only grown larger: today, the team at Presidential Pools has designed and built more than 26,000 pools in the Phoenix Valley and Tucson metro area. Presidential Pools is dedicated to you, the customer, like no other pool builder out there. Here are just a few ways in which we provide unparalleled service to you: -Our warranty is unmatched in its generosity. -We've built Arizona's largest pool park so that you can see features and equipment in action before purchasing them for your pool. -We were the first pool builder to harness virtual reality technology to help you experience what your backyard could look like. -We support you through the entire process of pool ownership with a top-notch service department solely dedicated to pools built by Presidential Pools. -We're the only pool builder to work with multiple banks to get you the absolute best financing options possible. Our finance manager, Natalie, amazes people every day with the affordability of some of our financing options. Since our modest start more than two decades ago, we've become a top pool builder in the country. Our size has allowed us to support our customers in ways that other small builders just can't. We're able to hire the absolute best designers and craftsmen to work on your project. We're able to invest in beautiful, clean offices and an incredible pool park. In Arizona, your backyard is more important than anywhere else in the country. It has the possibility to be your own personal oasis, and we'd be honored to help transform it! If you're interested, we would love to set you up for a free design consultation with one of our award-winning designers. These design services are totally free and no-strings-attached. Just give us a call at 480-967-9467 or use the "Contact Me" button at the top of this page. We look forward to talking with you soon! L A Custom Pools and Spas, Inc. Since 1972, Supreme Pools has been designing and building some of the most beautiful pools in Arizona. We are family owned and price projects competitively. As the second oldest pool company in Arizona we have the experience and knowledge to complete projects of any size and level of complexity. Our unique business is mostly based on referrals and word of mouth. See our many positive reviews from our happy customers. Our team includes talented, creative designers, engineers, and CAD technicians. Our project superintendents have decades of experience in the pool industry. We love getting to know new customers and count our many happy customers as friends. Supreme Pools specializes in beautiful, innovative pool designs that require the highest level of construction knowledge and expertise. We work with creative architects, quality custom home builders, and discerning home owners. It is our mission to not just meet your expectations, but to exceed them. Although we build some of the most complex pools in Arizona, we excel at building all ranges of designs, from simple, beautiful backyard pools to the most complicated large commercial projects. In the past 45 years Supreme Pools has been awarded over 120 local and international design awards from the Association of Pool and Spa Professionals (APSP, formerly NSPI) including two "Masters of Design" awards - the highest international award in the pool industry. Our projects have been featured numerous times in national and local publications. Our primary commitment is to serving our customers, and our award-covered office walls are a testament to our skill and commitment to excellence. Thunderbird Pools & Spas is a family-owned and -operated company. Since August 6, 2002, we’ve made it our goal to be the best Phoenix pool contractor designing and building beautiful swimming pools for our many customers in the Phoenix community. Hydroscapes LLC is a design/build firm for new pool construction and renovations, and provides a full array of services from conceptualization to construction. As a top ranked designer and constructor of luxury pools and water features, Hydroscapes LLC of Scottsdale, Arizona creates art from water and adds extraordinary value. HydroScapes president Roger Soares II is an award-winning designer with over 30 years of construction experience including construction of custom homes in San Diego CA, Aspen CO, Pennsylvania, New Jersey and New York with a strong base in commercial and industrial concrete and plumbing. The company has served clients throughout the United States and internationally. Roger Soares II is known for the creation of innovative pool, spa, and water feature designs that are in sync with every part of a landscape. Installations include intricate and complex design solutions in challenging hillside terrains. Working with homeowners, builders, architects, landscape architects, and design professionals who have a passion for creating beautiful and innovative pools, Soares develops projects using the highest standards of design and engineering. Three time winner of the exclusive Master of Design award (2005, 2010, 2016) from Pool and Spa News, Soares also received the 2005 Project of the Year recognition. His company was also presented the Luxury Pools Magazine Pinnacle Award in 2010 and 2016, a prestigious industry recognition. Soares is proud to be a Platinum Member of the Genesis 3 Design Group, an international forum for continuing education and the establishment of higher standards in watershape design and construction, as well as passing rigorous testing to receive the Society of Watershape Designers designation. Luxury Home, Pool and Landscape Design Build firm. Members of the Prestigious Genesis 3 Design Group. National and International Award winning contractors. Our dedicated, experienced team was founded with one simple goal in mind: to offer the best quality and service on every project. We strive to meet and exceed our customer’s expectations at every opportunity. Every home and backyard retreat we build is designed specifically for each of our clients. We build strong and lasting relationships with our clients through maintaining a constant open line of communication and delivering on our promise to build your project on time and within budget. As a true custom builder with a unique design approach, Red Rock utilizes an in-house CAD system to quickly organize, develop and define the ideas and concepts of each customer. This state-of-the-art computer-aided design allows you to explore options more easily and modifications can be computer estimated and printed out on the plotter within minutes. Our innovative designs will add an exciting new dimension to your home and many years of enjoyment for your family and friends. We are Arizona’s Premier Outdoor Living Solution. For 27 years, California Pools & Landscape has been the one-stop builder for all of your backyard needs. At California Pools, we believe that communication is extremely important to customer satisfaction during the various stages of pool construction. That’s why we provide a step-by-step overview of each phase – from the ground up. Meeting your expectations is our number one goal. We accomplish this by ensuring that each stage of your pool’s construction keeps moving forward smoothly. Premier Swimming Pool Designer Best of Houzz 2013-2018! We Fix Ugly Pools’ is the name that people of the Greater Phoenix area trust when they need expert pool remodeling, repair, or custom construction. We initially built our reputation by refurbishing and upgrading aging, and sometimes unsafe backyard pools, saving homeowners from the embarrassment of having an Ugly Pool in their yard. After a few years and after putting a few hundred amazing backyard makeovers under our belts, we were in high demand for building new pools too. From lap pools to plunge pools, exotic waterfalls to underground grottos, we aim to please. Now, after more than 15 years, we are the most recognized pool builder and remodeling contractor in the greater Phoenix region. If you’re looking for a backyard aquatic escape, you’ve come to the right spot. At WeFixUglyPools, we build more than pools..we build memories. 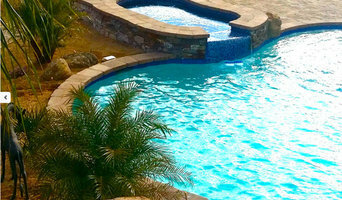 Phoenix's Trusted Swimming Pool Builders | Best of Houzz Service! Owners, Raul & Steve founded Dolphin Pools in 1984. Since then we have built over 10,000 swimming pools in The Valley of the Sun. This year we celebrate our 30th Anniversary! The legacy of Shasta began in 1966 when Bob Ast founded the business and built 26 swimming pools that year. In 1967, his brother Skip joined the team and sales surged to 235 swimming pools. In 1968 sales reached 535 swimming pools and Shasta became Arizona's largest swimming pool builder and has remained there ever since. Shasta has helped over 80,000 families enjoy the pleasure of swimming pool ownership and lifestyle. The family tradition continues with Skip Ast, President of Shasta Industries. His son, Jeff Ast, serves as Vice President of Construction. Through the years, Shasta has grown through constant innovation and by always striving to provide outstanding services to our customers. Today Shasta Industries consists of many divisions, all with a focus on the swimming pool industry and a drive to be the best. Shasta builds pools, remodels pools, manufactures pool products sold nationally and internationally, builds commercial and olympic pools, and has a word class service division that helps you care for your pool years beyond your initial purchase. Shasta Pools & Spas has three design centers valley wide which service the residential new swimming pool buyer. This division is recognized annually for its award-winning swimming pool designs and has built over 2600+ new swimming pools in a business year. Feel free to reach out to us, we would love to hear from you! Australian and New Zealand pool builders continue to push the boundaries in terms of design. Infinity pools, for instance, are no longer reserved for top-end holiday resorts; and lap pools aren’t standalone additions to a backyard. You can now get your feet wet in an infinity pool, lap pool or swim spa that is an integral part of your Phoenix, AZ home design. And, with improved technology, there are more low-maintenance, energy-efficient and sustainable options available. Whether you’re at the beginning stages of planning a pool or spa, renovating an existing one, or just need upkeep assistance, there’s a Phoenix, AZ pool specialist on Houzz who can help. After council approval, your contractor will commence construction, which can take up to two weeks for a fibreglass pool and longer for a concrete pool. Some companies in Phoenix, AZ extend their services to pool fencing, landscaping and the coordination of trades for filtration and heating equipment, as well as pool cleanings, water testing, renovations and equipment replacement or repairs. Here are some related professionals and vendors to complement the work of swimming pools & spas: Garden & Landscape Supplies, Landscape Architects & Landscape Designers, Building Project Managers, Landscape Contractors & Gardeners, Solar Power Contractors. 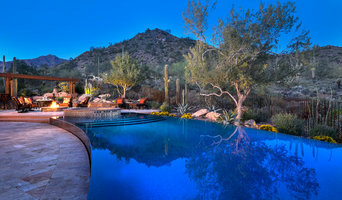 Find a Phoenix, AZ swimming pool and spa expert on Houzz.